In the beginning, I stuck to major manufacturers for my cloth diapering needs. Lately, though, I’ve been really enjoying WAHM businesses. One awesome WAHM business that makes great products is Cupcake Covers. Cupcake Covers is an Etsy store that has a variety of mom and family products. She started out with just nursing covers (or “cupcake covers”), but has since expanded. Now Cupcake Covers offers snack bags, cloth wipes, and wet bags… among other things. I’ve got one of her wet bags in my stash (and did a review of it), which is absolutely amazing. I actually like that wet bag better than I like my big name branded wet bags. Her cloth wipes? Gorgeous. Her snack bags are just as beautiful as her other things, and her unpaper towels have me ready to ditch my Bounty select a size and go paperless. Aside from the quality of her merchandise (which is equal to or better than major manufacturers), you can also get a wide variety of prints and patterns to coordinate with… well, pretty much anything. If you’ve got a jungle themed nursery, she’s got stuff to match. I like my travel wet bags to coordinate with my diaper bags, and the monkey wet bag that I have goes perfectly with the pink monkey toddler backpack that I use to carry my daughter’s things. If you don’t see what you’re looking for, you can always ask. She does custom work, plus she updates her inventory frequently. Stop by Cupcake Covers and browse her selection! What would you like the most from her store? 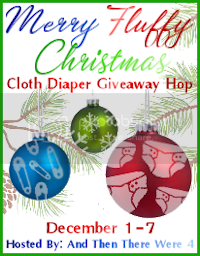 Cupcake Covers is one of our sponsors in the Merry Fluffy Christmas Blog Hop, so you’ll have a chance to WIN some of her awesome creations! Just checked out her Etsy shop – she’s got a lot of great stuff. I really want to start using unpaper towels and hers look great! Very cute stuff. Love the unpaper towels. I need to try me some of those. I would love some Mix n Match boy wipes. I ‘m checking them out on Etsy now and love the unique selection of prints available! The Robots Medium Wetbag is super cute! Definitely something I’ll look into getting! I really would like the Teal Demask– Reusable Wipe Clutch– Mama Cloth Clutch– 9x 7! And from Lagoon Baby – I would try a RumpaRooz – have you seen that Lux print!? OMG. Hah! Yeah, I actually have it. 🙂 It was my first RaRz ever, and I completely love it. I really like the Fruit Toss –reusable snack bags! I love the pocket diapers in the fun colors! I would get the Retro Red unpaper towels from Cupcake Covers! Too many items to list….lol. To start I would get some more diapers and wipes. Wow what don’t I love lol. I really like the unpaper towels and cloth wipes. The unpaper towels and the cloth wipes. So much to choose from! I love the sassy patchwork set! Very cute! I love their Unpaper Towels! I would get the sock monkey print wetbag from cupcake covers. I’d get the robots medium wetbag. I’d love some unpaper towels! I would get the Christmas special Unpaper Towels. So cute! I love the majestic elephant print wet bag. I would buy the Birdseye and bamboo pre fold. Love the elephant wetbag as well! So cute! I would get the robots wet bag! I love her pink paisley wetbag! I love the robots wetbag! I’d love to have that Robots Medium Wetbag. I’d get their unpaper towels.